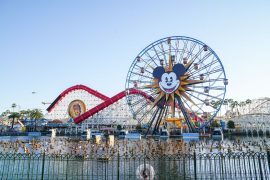 Now that we’re fully into our Back-to-School routine, I’m itching to plan some more trips! 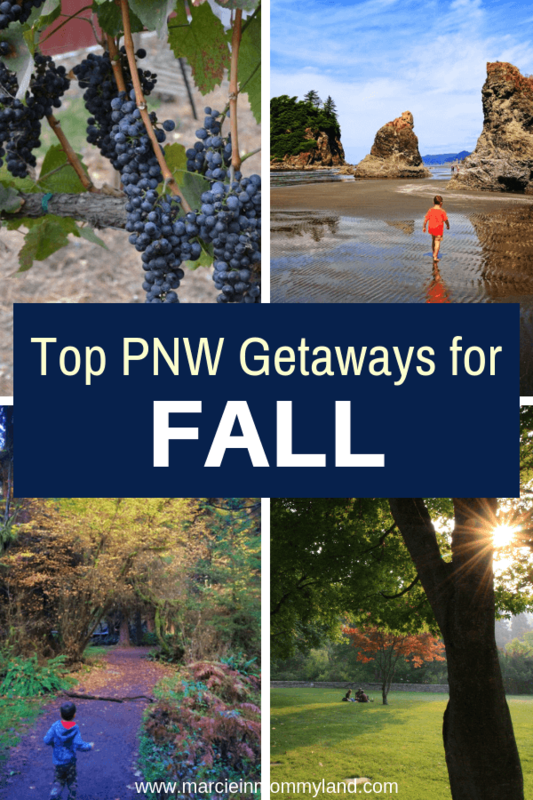 I’m always on the hunt for cool Pacific Northwest weekend getaways for Fall. So, I asked some of my Seattle blogger friends to suggest their favorite Pacific Northwest weekend getaways. Plus, I added in a couple of our favorites, too! May contain affiliate links. A gorgeous getaway in the Pacific Northwest is Olympic National park. 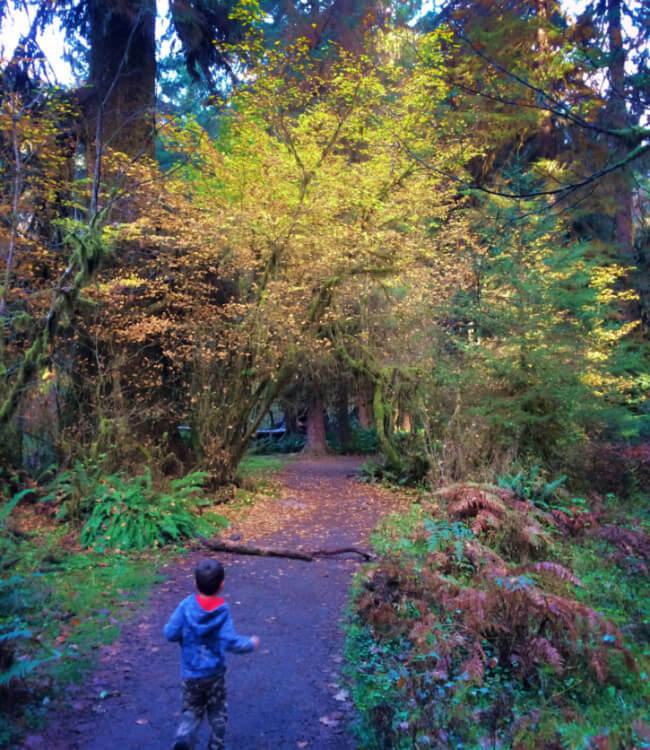 Head over to the western side of the park to visit the Hoh or the Quinault Rainforests and you will see some of the most jaw-dropping, moss-covered groves of maples. The fall colors in Olympic National Park start to change in mid to late October, coming to a peak in early November. 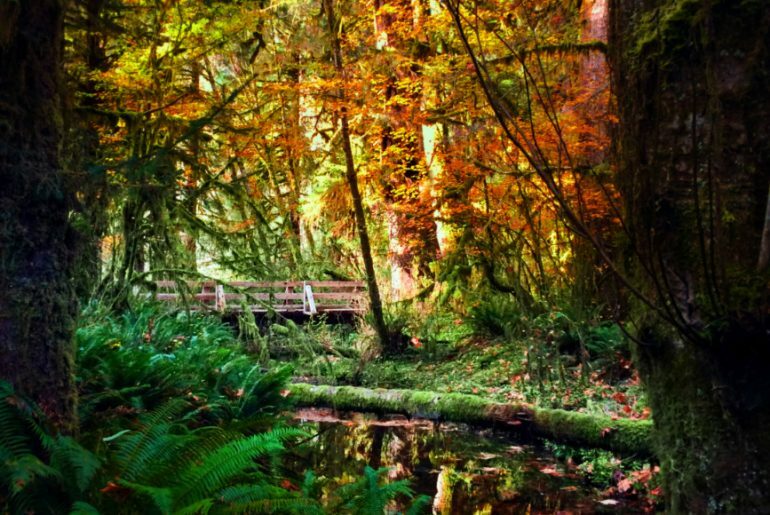 The contrast of red, orange, yellow, and green make for overwhelmingly colorful sites, and with a temperate climate, this establishes Olympic National Park as one of the best fall getaways from either Seattle or Portland. 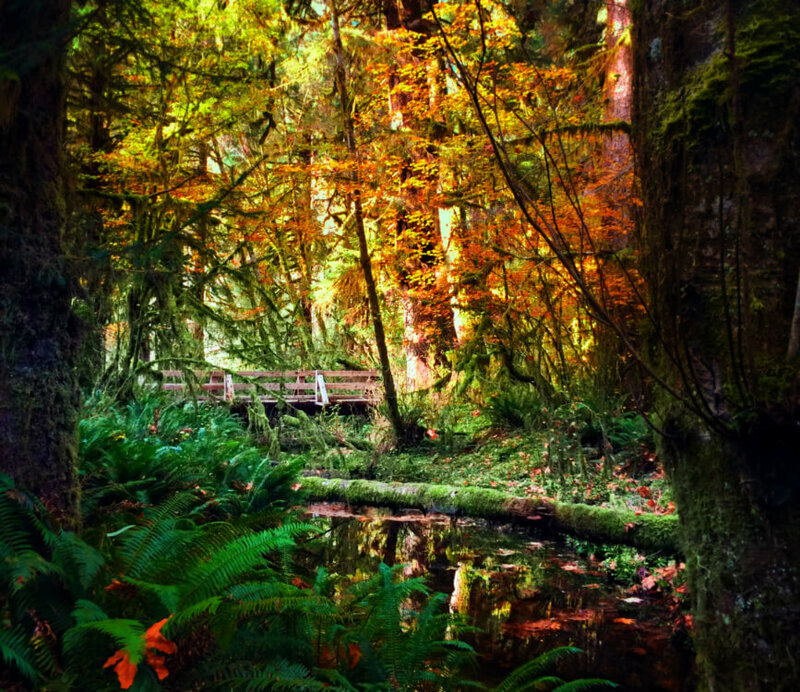 Hiking is good in the Hoh Rainforest year round and enjoying the fall colors is something we are sure to never miss. But if you’re a PNW person at heart, you might actually prefer to enjoy the quiet beaches of Olympic National Park. Kalaloch and Ruby Beach are both very near the rain forests and in the fall and winter months are all but deserted. They’re just as gorgeous as summer time, but just a bit more moody. 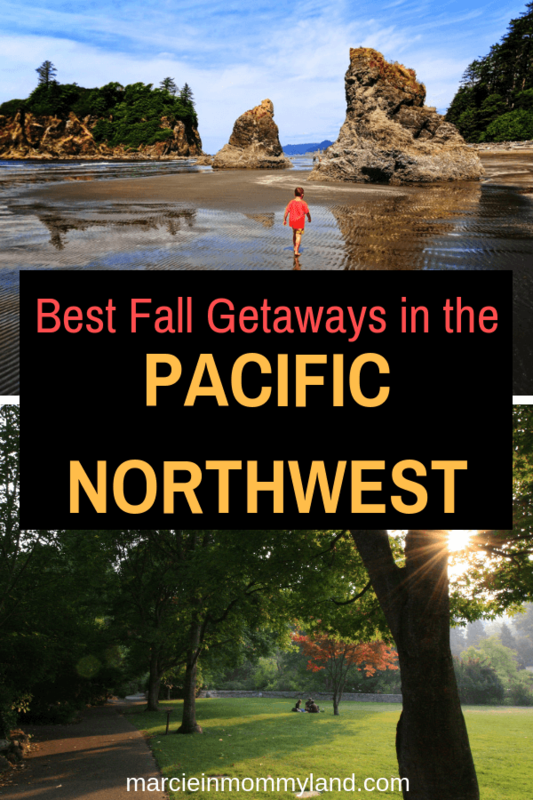 Kids don’t care about that though, so if it’s a Pacific Northwest weekend getaway for Fall you’re looking for, might as well make it the beach! 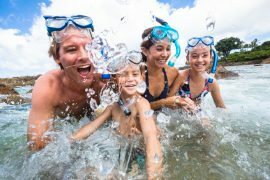 Options for family-friendly hotels include: Lake Quinault Lodge, Holiday Inn Express, and Rain Forest Resort Village. Many people head to Lake Chelan and the surrounding areas in the summer, but I prefer visiting in fall and winter. Fall is grape harvest and barrel tasting season, so it’s a great time to visit one (or five!) 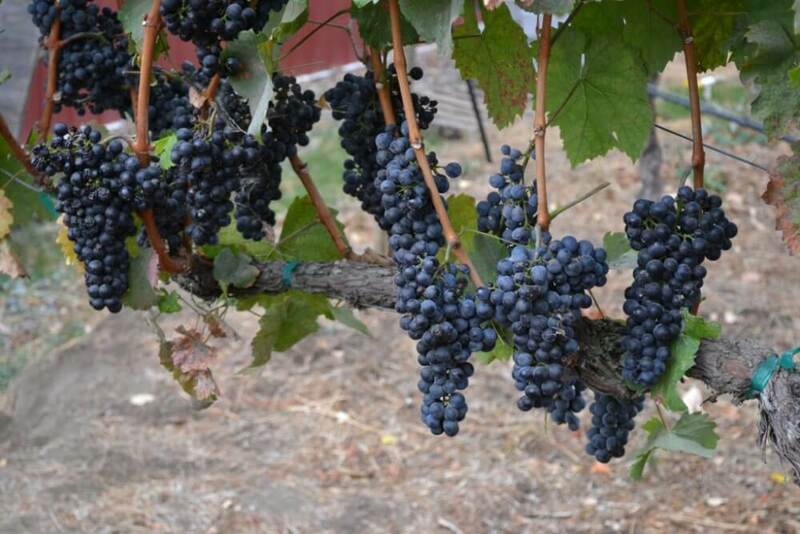 of the best Lake Chelan wineries. The trees are starting to turn colors, the crowds are thinning out, and most of the wineries allow kids. Some even have lawn games or playgrounds. Besides wine, there is a ton of fun to be had for the whole family. 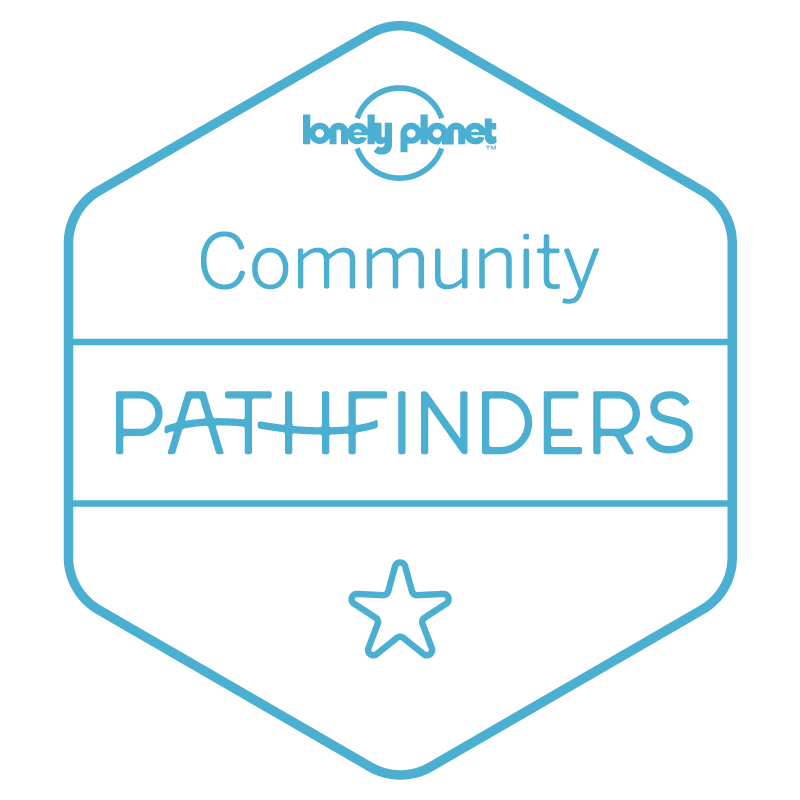 Get outdoors by exploring more than 250 miles of hiking trails. 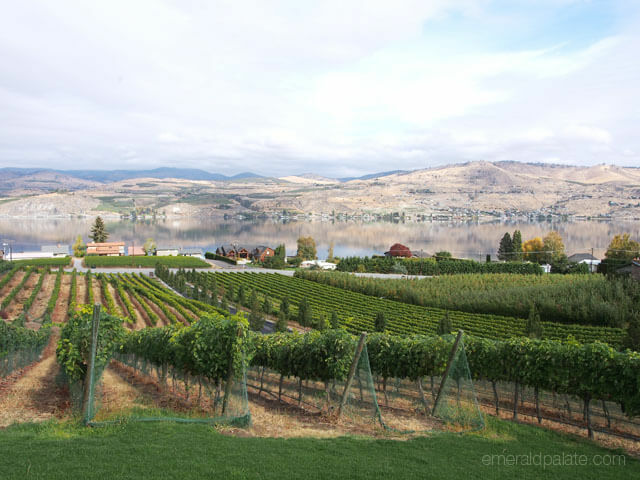 Lake Chelan is also a big apple growing season, and fall is the perfect time to press some fresh apple cider or visit a u-pick apple orchard. You can also explore some of the surrounding areas, such as the Methow Valley about 45 minutes away. Winthrop is a great home base for exploring the Methow Valley trails, where you’ll find more hiking, biking, snowshoeing, and cross-country skiing routes. Some recommended places to stay in Lake Chelan with kids include: Lakeside Lodge & Suites, Lake View Hotel, and Campbell’s Resort on Lake Chelan. Washington is so beautiful during the fall, it can be difficult to decide which town or city to visit. There is a charming town about 3 hour drive from either Seattle, WA or Portland, OR. called Prosser. In Prosser you’ll find that small town vibe but they are very welcoming to visitors, and amazing photo opportunities with beautiful fall colors. This small town is home to over 30 wineries and breweries so it’s the perfect getaway for adults only. With annual wine tasting events and year round wine tours and excursions. 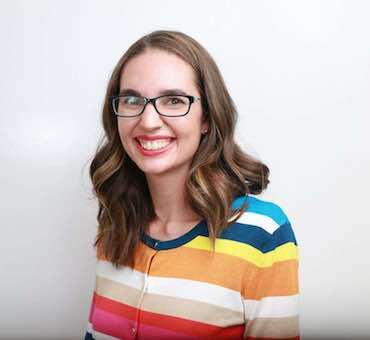 Prosser is also very family/pet-friendly; visit Benton County Historical Museum, more than 5 parks, farmer’s markets, shopping, Chukar Cherries, Princess Theater, skating rink, Brewminatti a coffee shop with live music, and more. If you’re traveling with your children and don’t want to miss out on the wine experience, be sure to check out Gamache Tasting Room which is family and pet friendly, you’re welcome to bring your own picnic. Prosser hosts many annual events throughout the year including Great Prosser Balloon Rally. 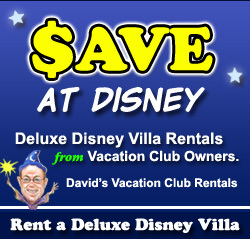 Visit year around, bring the whole family or have an adult-only getaway! Your best options are to stay at the Holiday Inn Express & Suites or the Best Western Plus Inn at Horse Heaven. 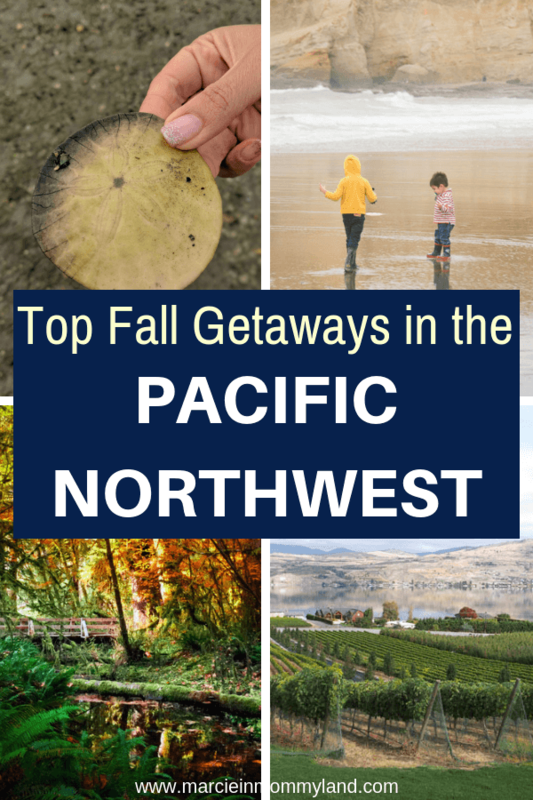 Like Rob suggests, the beach can be a really fun Pacific Northwest weekend getaway for Fall. Kids really don’t care that it’s a bit chillier than summer. In fact, my 4 year old asked if he could go swimming in the Pacific Ocean on a 60 degree day and he was completely serious! 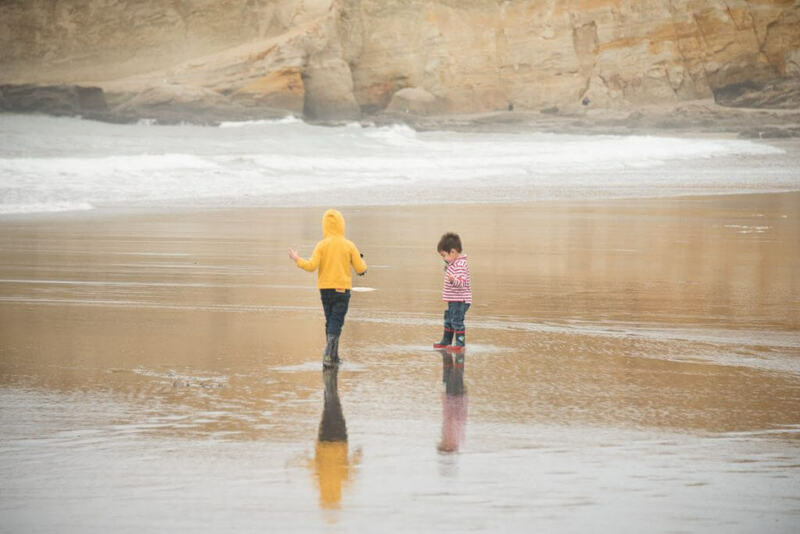 My family recently spent the weekend at the Inn at Cape Kiwanda and the kids had a blast! We stayed in the O’Neill Surf Suite and the kids got to sleep in bunk beds that looked like a vintage VW surf van! Plus, our room had kids books, toys, games and an incredible view of Haystack Rock. It’s also less than an hour drive from the Tillamook Creamery, the Oregon Coast Scenic Railroad, and the Evergreen Aviation & Space Museum. These are my top picks for cool places to stay in Pacific City: Inn at Cape Kiwanda, Headlands Coastal Lodge & Spa, or Hart’s Camp. Fall is a magical time in Ashland, Oregon. Best known for the Oregon Shakespeare Festival, Ashland is a small town tucked into the mountains of southern Oregon. Just three hours from the Oregon Coast and two hours from Crater Lake National Park, Ashland can be a stop on a PNW road trip or a destination by itself. Because of it’s southern location, Ashland is a little less rainy in the fall than many other PNW destinations. And the fall colors are lovely. In addition to world class Shakespeare (check the OSF website for age-appropriate play recommendations and study guides) the Ashland Children’s Theatre has performances and workshops geared toward kids and teens. Even if you’re not at the theater there’s a lot to explore and keep you busy in Ashland! 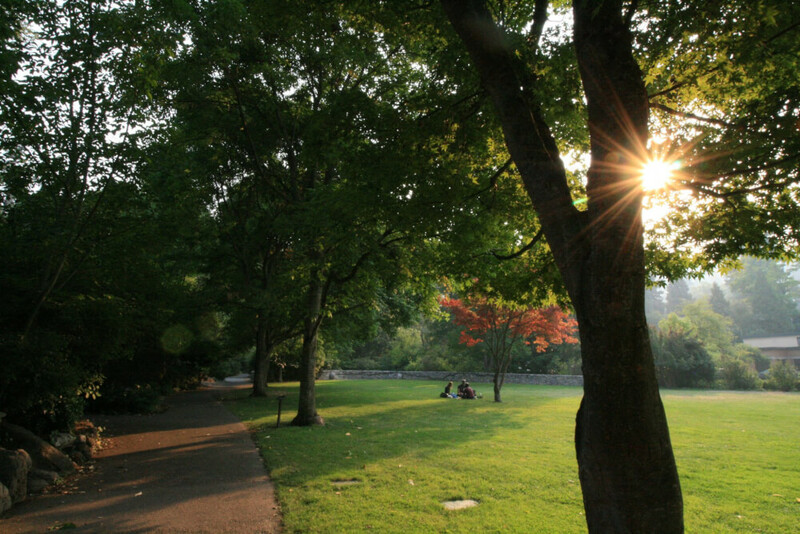 Historic Lithia Park in the center of town has a mile-long trail, a duck pond, a rose garden, and a great playground. You’ll find plenty of small-town shopping and restaurants for all ages along Ashland’s Main Street — if you have little ones along don’t skip a visit to Unicorn Gifts and Toys. Some of the top places to stay for families include: Ashland Hills Hotel & Suites, Plaza Inn & Suites at Ashland Creek, and Ashland Springs Hotel. One of our favorite places to go for Pacific Northwest weekend getaways for Fall is Portland, Oregon. It’s just a 3 hour drive from Seattle (depending on traffic) and it’s just such a cool city filled with kid-friendly activities and cool places to stay. We always hit up Powell’s Used Books (it’s incredible! ), the Oregon Museum of Science and Industry (OMSI), and the trolley that goes all over Downtown. Last year, we went to the Oregon Zoo and I really liked the layout. 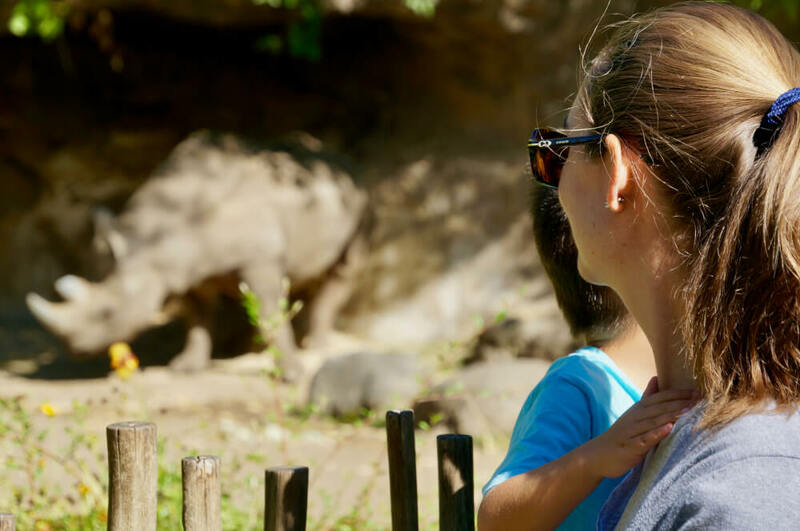 Plus you can see rhinos, elephants, and ride a little train. 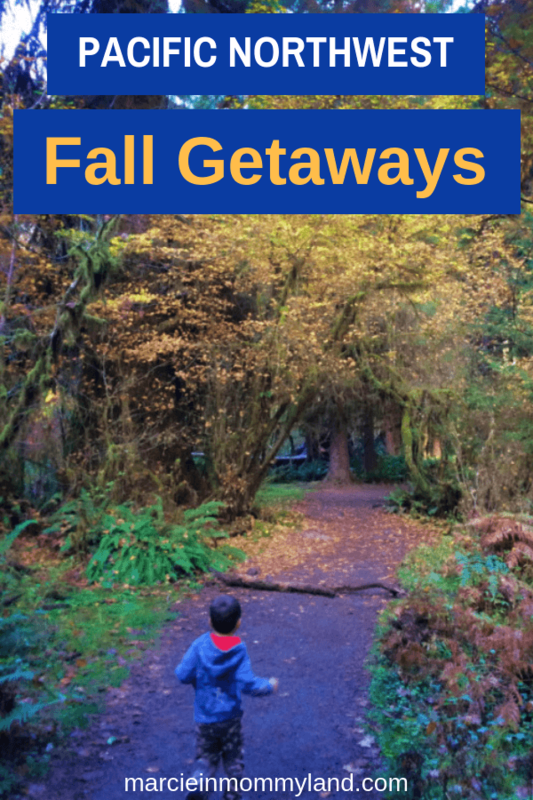 Really easy to do with little kids and the trolley can take you there from Downtown Portland. And there’s so many kid-friendly places to grab food. Our top picks are Pine Street Biscuit, Blue Star Donut or Voodoo Donut, Elephant’s Delicatessen, Wailua Shave Ice and the list goes on and on. Some of our favorite picks to stay with kids in Portland include: Inn at Northrup Station, Mark Spencer Hotel, and the Kimpton Hotel. Parksville, BC on the east coast of Vancouver Island is a great place for families to visit in the fall. The weather in the area is still not too cold to get out and explore. And the ferries to Vancouver Island won’t be as busy as they typically are in the summertime. Parksville is about a 30 minute drive from the Nanaimo ferry terminal and a great place to stay with kids is the Tigh-Na-Mara resort that has a pool, playground, basketball hoop and easy beach access. A famous market, the Coombs old Country Market, is a short drive away and is known for having goats that live on the roof of this fun place to shop, eat a meal and enjoy tasty ice cream. Don’t forget to bring your rain boots and sand pails! Terumi Pong from An Emerald City Life. 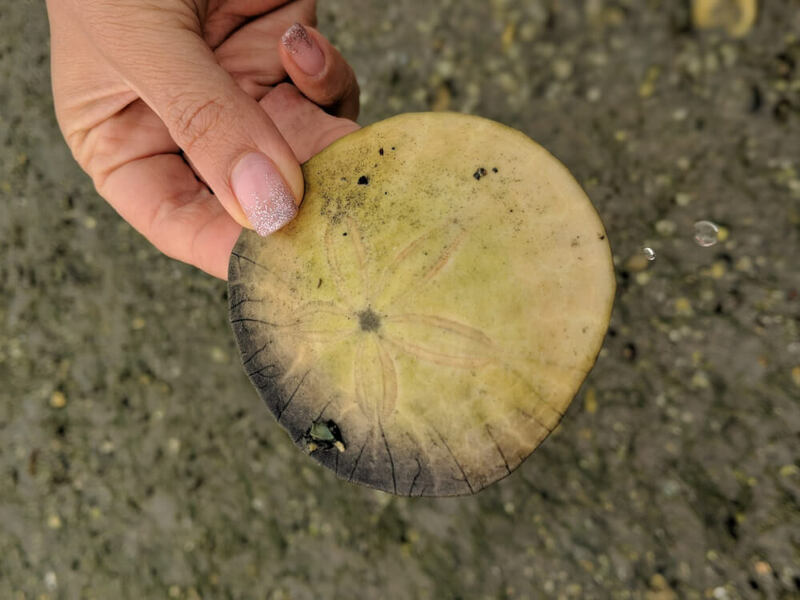 If you’re heading to Parksville, you might want to spend a few days at one of these hotels: Beach Club Resort, Tigh-Na-Mara Resort, or Sunrise Ridge Waterfront Resort. You’re making me want to quit my job, hop in my car, and drive around the PNW for weeks! Great spots, and so gorgeous. ? We’re so lucky to live here! Haha! You should definitely do a PNW road trip one of these years! It’s gorgeous here!